A London based location sound recordist, production sound mixer and audio mixer with many years of experience in the sound recording and mixing industry. Based in London, UK, with a highly personable and organised attitude. Possesses a broad range of skills in the TV production / Film, commercial, corporate, broadcasting, event, and audio-visual sphere. A sound mixer in London, UK with fast array of experience and knowlage. Extensive experience in all types of production sound; TV, commercial, corporate, documentary, film, 360, VR, Binaural and branded content. Based in London, United Kingdom and happy to travel anywhere! Many, many hours of on-set experience working with every type of client. Someone you can trust to work harmoniously with any crew, whatever the shoot. Holds clean UK car and motorbike licences. UK passport holder, DBS / CRB checked, friendly, professional, hard-working and a can-do attitude. Getting the job done to the highest quality is the name of the game. Worked alongside some A-list talent & directors/producers such as: Ed Sheeran, Danny Dyer, Stormzy, Richard E Grant, Jonathan Ross, Johhny Vaughn, Robbie Williams, Celia Imerie, Dame Diana Rigg, Sanjeev Bhaskar, Sir Ian Mckellen, Hugh Jackman, Robbie Williams, James Blunt, Gary Lineker, Guy Ritchie, Jamie Oliver, The Christley’s, Nick Ferrari, Elkhart Tolle, Dexter Fletcher to name a few! 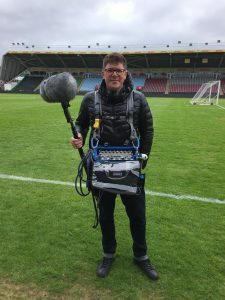 Major commercial and corperate clients as a sound recordist / mixer including; Netflix, Amazon Prime, Channel 4, FIFA, BBC, Disney, Nike, USA, Bravo, VICE, France 5, Toyota, ITV, Saatchi & Saatchi, Google, USA Network, Microsoft, Sony, RTE, Neilson, Christies, Deutsche Bank, SYCO Music, Grand Public, Hyundai, LBC, Amey, DNA Films. Whether it’s a small Portable Single Camera (PSC) Doc or corporate job, a large scale multi-camera reality TV job, A full scale commercial or Drama or something more specialist like a music recording, VR / 360 sound capture or extreme conditions recording kit choices for sound department are important! Below is a list of the core kit, additional items can be sub-hired for specialist jobs. 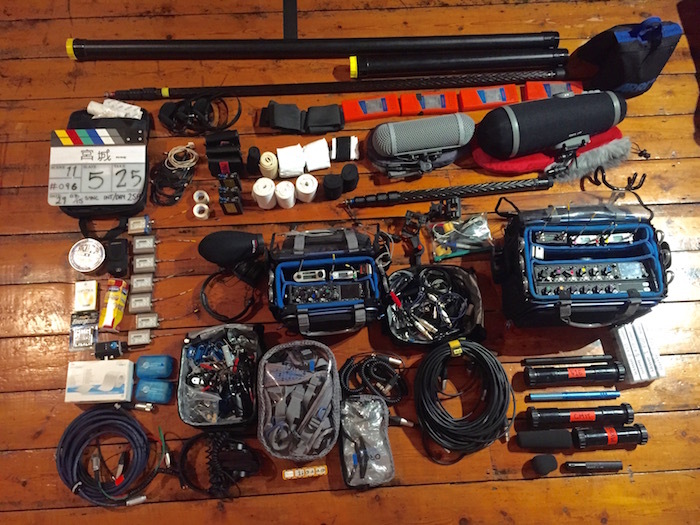 A few major considerations when hiring sound kit is having sound back-ups, timecode sync and IFB / wireless headsets. Having sound backed up (recording in more than one place) it is always recommended, this is achieved by having it recorded in the sound bag and on the camera and this can be done using a stereo wireless hop (see below) which is dedicated transmitter in the sound bag going to a dedicated 2 channel receiver mounted and powered from a V-Lock plate on camera. A cheaper option for getting audio onto camera for playback and first edits (but not for final mix) is a mono ‘scratch’ hop. Timecode is a seriously time saving tool for post-production workflow. Having the camera’s TC and sound recorders TC synced means that in post the sound files and video files drop seamlessly together and sync is done for you. TC sync is achieved by using TC lockit boxes that are synced with the sound bag (the master) on TOD (Time Of Day) timecode and then feed the camera with the exact same timecode accurate to within a 1/4 of a single frame over 24 hours. The boxes are very small and self powered and will save much more time in post than they cost to hire per day on set! In addition, both as a backup and to aid cameras without TC sync a ‘timecode clapper board’ or ‘smart slate’ can be hired (see below) which gives a visual readout of the timecode and the age-old traditional ‘sticks’ snapping for the audio/visual sync point. IFB or Interruptible fold-back receivers are essentially wireless receivers with headphones that can be hired (see below) for listening into the sound mix on set. Several different mixes can be sent out e.g. Just lav mics, or just boom or overall mix. Giving Director, client, producer, script supervisors or anyone else a listen into the audio being captured on set. Rycote Windjammers + Mic Clips, Suspensions. Timecode connection cables for RED, Arri, Sony, Canon, Blackmagic, Panasonic, Denecke etc.